wood decorative pet steps are a solid alternative to plastic or foam steps. pet steps are made using solid Australian pine with raised panels for an elegant and traditional look. The panels are joined to the frame of the pet stairs using dovetail construction - an extremely strong wood joint that is often found on fine furniture. the dog steps are strong enough to hold up to 250 lbs - so both you and your pet can use them to get into bed! TWO MODELS - the 2-step wooden dog stairs and the 3-step wooden dog stairs. 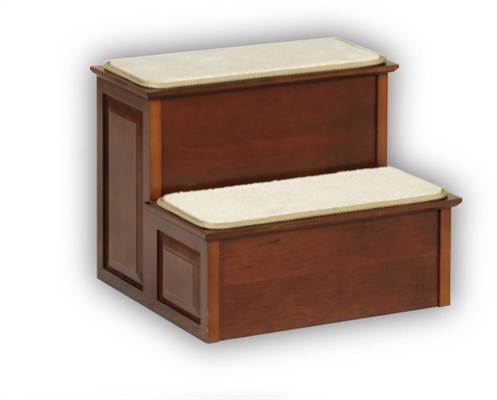 The 2-step wood steps for dogs are perfect for most chairs, couches and sofas. The 3-step wood steps for dogs will reach beds up to 27" high.